The club offers a home cooked hot meal in a friendly setting to all senior members of Broadmayne and West Knighton. 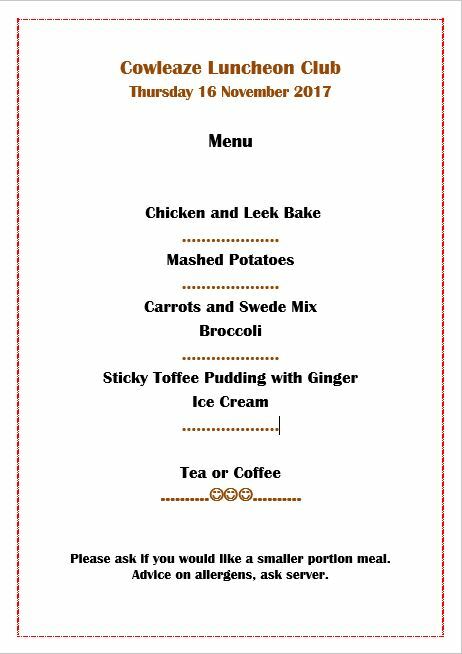 The two course meal is cooked and served by volunteers at 12.30pm, in Broadmayne Village Hall on the third Thursday of the month. If you would like to come along and join us for a meal, for which there is a charge of £4 (2018), please contact Marilyn Holehouse on 01305 261337. Please let us know if you have any dietary needs and we will arrange to fulfil them.